How much does it cost you to find a customer? Aside from good old ‘word of mouth’, how else can a heating engineer find new customers? Paying to advertise via traditional marketing can feel a lot like throwing money into a black hole with fingers crossed. It’s harder than ever to make your business stand out in the crowd and, even when you can, it’s often luck of the draw whether your marketing is seen by the right people. Does your business need more sales? We’ve taken a look at the most popular marketing platforms for heating engineers, what each is likely to cost you and, of course, why Holmes Media is different. Yell.com is an online version of the Yellow Pages. You can place a free listing on the website but this will only be visible for customers in the area that you’re business is registered in, not necessarily the customers you want. For maximum visibility in multiple locations and in as many different ‘categories’ as possible, you’ll need to pay a subscription. Checkatrade is another subscription based online business directory, but with a slightly different angle as they don’t allow just any business to sign up; you have to pass strict background checks, promise to meet ‘The Checkatrade Standard’ and agree to have customer feedback visible on your Checkatrade profile page. Which? Trusted Traders is an “endorsement scheme”. To become a Which? Trusted Trader you need to apply online and pass a detailed assessment. There is an upfront, non-refundable £240 assessment fee and then an ongoing monthly fee. If you’re accepted as a member you get a dedicated profile page on their website and can use their logo in your marketing to “give your customers confidence”. Rated People offer similar benefits to the trade directories and endorsement schemes but they also sell sales leads. However, to be able to buy them you need to join Rated People as a member and pay a subscription. The most popular is £35 +VAT per month; for that you’ll then get £45 back in ‘credit’ to spend on leads each month as well as a membership discount scheme. How much does it cost you to get a new customer? With the exception of Rated People, what all these services have in common is that they charge you for being a member or having a listing, but there’s no actual contact with customers. In the case of Rated People you can buy sales leads which come through their website (some of the cost of which is covered by your subscription fee) but even if you don’t need leads, you still need to pay the subscription fee. So in busy times when you’re finding your own customers, your Rated People membership is a cost with no ROI. How Does Holmes Media Compare? At Holmes Media we don’t charge you for your company profile on our websites. There’s no monthly subscription fees or commission on the work that you win. We only charge you for the leads you choose to buy. You’re under no obligation to buy any leads at any time. We typically hear that our boiler sales leads convert at around 35%. That means for every 3-4 leads you buy from us, 1 should turn into a paying customer. So at an average price of £30 per lead for a new gas boiler, a new customer will cost you approximately £85. Some other services tie you in with minimum contracts so if you decide you don’t need the advertising or leads anymore, you’ll be obliged to pay for the duration of the contract, or at least to give a notice period. At Holmes Media we think it’s important that you stay in control of your business; we only want you to buy leads when you need them. In fact, we’re so confident that you’ll see the value in buying our leads that we don’t need to tie you in with contracts. Aside from Rated People, none of the other services actually provide you with leads for customers. Your money buys a profile on their website, but whether that results in new customers or not is a gamble. At Holmes Media we put you in the driving seat. The leads you buy from Holmes Media are customers who have actively requested quotes from companies in our network. They’ve asked to hear from businesses like yours! We contact every customer who submits an enquiry to check they are both genuinely interested and to confirm their contact details. If the lead is in the right location and the type of work you want, we’ll let you know so you can decide if you want to buy it or not. When you do buy a lead, it’s up to you to contact the customer and provide your quote unless you’re using our online quotation platform YouOffer. With Rated People, Checkatrade and Which? you’ll pay for a profile page or listing on their website to advertise your business as part of your subscription. At Holmes Media we also give you your own business profile on our website, the difference is we don’t charge you anything for it. Yell.com are the only other service to offer a free listing, but this is only visible to people searching in the specific region that your business is registered to. With Holmes Media, your free business listing is visible to over 2,000,000 visitors to the Boiler Guide website, wherever they are in the country. Like Which?, Rated People and Checkatrade, we check all businesses who register with us to ensure they have the correct accreditations and their quality of service meets our standards. We then make it clear to customers that only businesses which pass our initial and ongoing quality checks are able to provide quotes. In addition, the customer feedback you receive via Boiler Guide customers will be displayed on your company profile where you’ll build up a collection of reviews and an average ‘star’ rating. The better your feedback, the more leads we will offer you and when customers use our directories to contact you directly (as many do) they will obviously veer towards the company with the best reviews. That means you’re more likely to win a customer via a direct enquiry which we don’t charge for. Your online reputation matters and Google is by far the most popular and most influential search engine in the world. In the last year or so Google has started collecting reviews from websites which are trusted by users and now publishes them alongside a company’s listing in Google search results. 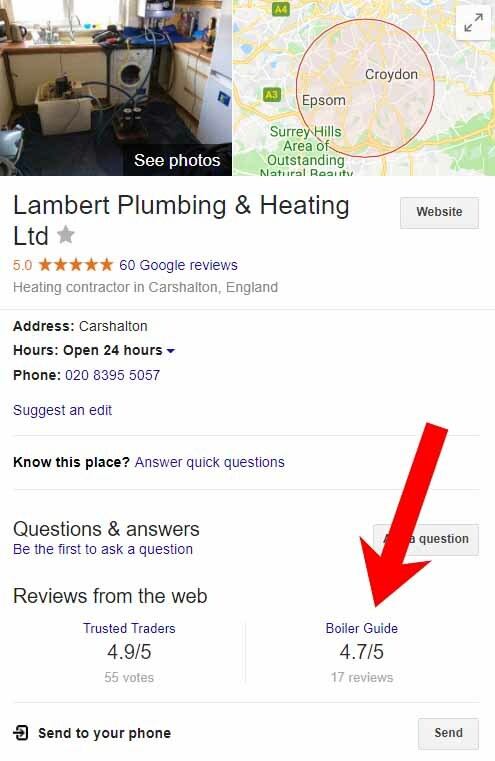 So when a customer searches for your company, Google will show them how you’re rated on a select few of the most reputable and reliable websites; this regularly includes the Boiler Guide rating. Your Boiler Guide rating in Google is a quick and easy way for a potential customer to make a judgement about whether or not they want to hire you. Imagine for a second that you’re choosing between 2 heating companies; one has no visible reviews in Google and the other has a 5 star rating from Boiler Guide, which one would you choose to contact? How Else Can You Advertise Your Business Online? SEM is sometimes referred to as paid search advertising, PPC (pay-per-click) or CPC (cost-per-click). You can buy adverts on search engines like Google, Bing and Yahoo, most of which are sold on a CPC / PPC basis. This means you only pay if someone clicks on your advert which takes the user through to your website. Native advertising is placing adverts in websites which don’t look like adverts but more like natural parts of a webpage, e.g. articles or blog posts. You’ll have seen headlines or images around in websites which can easily be mistaken for just another piece of content, but they will have been written with the intention of advertising a business or getting you to click through to another website. Often they will be labelled as “promoted” or “sponsored”. The idea behind it is that modern customers have grown accustomed to tuning out banner adverts when they’re browsing online, but native advertising should bypass those habits and catch their attention. You can also advertise on social media platforms like Facebook and Instagram. You create the advert and choose which demographic of people you’d like it shown to based on age, gender, location or interests. Like PPC / CPC on search engines, you’ll only be charged when the advert delivers what you want it to, whether that’s a click through to your website or a certain amount of impressions (views). What are the Pros of Online Advertising? You only pay if someone clicks on your advert or if your advert is viewed a certain amount of times. You can control how much you’re willing to pay for each click and set up budgets to control your daily or weekly spending. You can target the adverts to certain places on the internet where you think your audience is likely to see it. What are the Cons of Online Advertising? The risk with both native and PPC advertising is that if your advert attracts lots of clicks but from people who aren’t likely to convert to customers, you’re going to end up paying out for very little return on your investment. It takes skill, time and effort to manage PPC campaigns effectively; in fact, many people outsource this to specialist agencies. Targeting by location or demographic is not a particularly useful tool as it’s not based on any real intention or need for your service. If you don’t monitor your costs on a daily basis they could get out of control. Native advertising in particular can be quite costly when compared to other forms of marketing and is really only suitable for company with large budgets to burn. Even if your advert does attract a lot of clicks through to your website, you still need to convert them once they’re there, so it could be a wasted effort. Click fraud is a risk, i.e. paying for clicks from competitors, bots, unscrupulous website owners who do so to increase your costs. Competitive industries like solar, boiler and window installation can attract very high costs per click. At Holmes Media we have a team of digital marketing experts who have been managing online advertising and PPC campaigns for years. We’re optimising effective PPC campaigns all the time to reach attract customers from all over the UK who are looking for boiler installers. We advertise so you don’t need to and when we find a customer in your area for the work you want, we’ll let you know with SMS and email alerts. At Holmes Media we sell fixed price leads on a pay-as-you-go basis; that means you only buy a lead when you want, you know exactly what you’re paying and you only spend what you can afford. With PPC advertising across any platform just because someone clicks on your advert doesn’t mean they are interested in your service. When you buy a lead from Holmes Media you know they’re a genuine customer in your area; they’ve found Boiler Guide, entered their details into our form to request a quote and we’ve already contacted them to make sure they’re ready to buy. They’re waiting to hear from businesses like yours and when you buy the lead we tell them your company name so they will be expecting your call. Taking an advert in a local newspaper is a definite gamble, and not a cheap one. It’s not uncommon to pay more than £250 for a quarter page advert. It’s not usually advisable for small business unless unless you’re prepared to risk losing the money, you’re running a series of adverts, finding 1 or 2 customers will take you into profit or it’s a limited time offer. You’re likely to face costs of £200+ for magazines with the smallest readerships and this can get considerably higher. Advertising on local radio can be effective, but only if you have the budget. The price of your radio ad will depend on the duration of the advert, when it is aired, how many listeners the show has at that time and how often it is repeated. The perfect timing is needed to reach your target audience and repetition (preferably over a long period of time) is key. On average radio advertising will cost you around £2 for every 1,000 listeners. To give a very rough perspective, a week-long campaign that uses a 30 second ad (minus production costs) could cost anything from £500 on a local station to £2,500 on a regional station. You’ll also need to factor in around 10% of the costs for creating the advert. It should come as no surprise that TV advertising is pricey and most effective when used for mass marketing rather than local or niche businesses. For a 30 second advert on one of the mainstream channels you’re looking at a cost between £4,500 to £30,000 depending on the time of day. Some smaller digital channels have prices as low as £50 for a 30 second advert during the day, but this advertising isn’t targeted to any demographic and without a lot of repetition is unlikely to yield results for local businesses. So, how does a heating engineer find new customers? It’s clear that there are more marketing platforms out there for independent traders than ever before, but which is likely to result in a paying customer? You could choose to pay for a business listing on an online directory such as Yell.com or Checkatrade. These services can give your business more visibility which could potentially result in an incoming customer enquiry, but you’ll have no way of finding new customers yourself. You could choose to rely on the quality endorsements which Checkatrade and Which? Trusted Traders offer, but again you’ll have no way of proactively finding new business. You could of course sign up to Rated People where you can buy leads for customers, but you’ll be paying a monthly subscription whether you need leads or not. Online PPC advertising can be effective if you’ve got the time, budget and marketing skill to manage it, but again the effort and resource involved with no customer contact is a gamble. Then of course there’s the traditional mediums of print and broadcast advertising like newspapers, magazines, radio and TV. Without a big enough budget for the right creative input and effective repetition, the vast majority of small businesses simply can’t afford to send their message out into the ether with no guarantee of reaching the right audience. No sign up or subscription fees – only pay for the leads you need. No-obligations, contracts or minimum spends – buy what you want, when you want. 24/7 access to customers in your area who have asked to receive your quote – we use different types of qualification to verify that the customer is ready to buy. Establish your reputation as a Boiler Guide Trusted Tradesperson. Manage your own workload – from 1 lead per week to 100s per day, we can deliver at a rate that works for your business. Advertise for free with a business profile on our website – over 2 million people visit our websites each year to get quotes from trusted tradespeople. 1. Sign Up for FREE Just tell us a few details about yourself, your company and the jobs you’re interested in. 2. View & Buy Leads Once you’ve signed up you’ll be able to view the job leads in your area each month. 3. Quote on Jobs Do what you do best, provide a competitive quote and win the customer. How energy efficient is my boiler? Should You Buy Boiler Sales Leads?